... Not for the faint of heart! Welcome and enter at your own risk! We urge you to take your time and enjoy the experience as you get to know one of the worlds most extreme offshore racing teams. 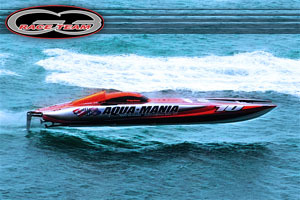 Aquamania/G3 race team is the current 2007 and 2008 SBI national champions in the extreme class of offshore racing. As we embark on the 2009 racing season we will push the sport to new levels with the most technologically advanced powerboat on the planet.Join us live on board via satalite and experience the one of a kind thrill of turbine power at speeds of over 200 mph in extreme ocean conditions at exotic locations. As you scroll through the pages you will be exposed to the highly addictive sport of offshore racing.Our teams mission is to advance the sport,our team and future sponsors to another level. Above all we hope everyone who joins us has as much fun as we do! ... Come Join the Fun!